SPI volumes have broken another record with over 2.2million contracts trading in March up 20% year on year and up 10% since last roll/previous record (December). Single Stock Options and Index Options saw a slight decline, however Total Return Single Stock (TORESS) LEPOs were at their highest level since June 2017 with an increase of 232% compared with March 2017. March 2019 delivery saw a total of 47,180 tonnes being tendered substantially higher than the March 2018 delivery of 27,740 tonnes, proving the ASX futures are continuing to be used for physical delivery as well as a price/risk management tool. Aggregate Open Interest in the East Australia Wheat contract (9892 lots) still remains substantially higher than the last couple of years at this time. Benchmark crude futures averaged 7% higher in February compared with January, continuing to be buoyed by growing optimism over a US-China trade deal. However, by early March, the rally had stalled. The path to a trade agreement has been tough and the negotiating teams have been working through major hurdles right into the final stages, especially around the structural changes Washington has demanded of Beijing and the implementation mechanism. As a rising tide of crude from the Permian begins to flow to refineries and export terminals along the US Gulf Coast, the market needs a reliable and transparent value for the barrels at oil terminals on the USGC. The recently-launched WTI Houston crude futures contract aims to serve that purpose. SPI volumes were still strong against the previous month but down compared to the record volume we saw in February 2017 due to lower volatility. Single stock options had a slight increase in volumes whilst Index options followed the futures trend down. Australian equities did perform better than all other asset classes last month with good gains across several sectors. A-REITs saw the strongest returns and Financials were helped by the relief that the Royal Commission was not as bad as feared for the banks. VIX remained flat hovering from 13 down to 12 by month end. Industry experts Dave Hightower and Dan Basse preview the March Crop Production report to be released on 8th March 2019. Markets could see elevated volatility in 2019 as the lag effects of the trade war and massive tax cuts that have widened the budget deficit, resulting in a jump in Treasury yields, hit home. And, the deceleration in the growth of corporate profits could make it a challenging year for equities and test the pace of Fed rate hikes. Will lag effects of interest rate hikes, trade war with China show up in 2019? Could equities volatility escalate in 2019 as bond yields rise amid growing budget deficit? The November 6 U.S. Midterm elections are fast approaching, and the uncertainty of new policies or a divided congress can impact volatility and stock prices. 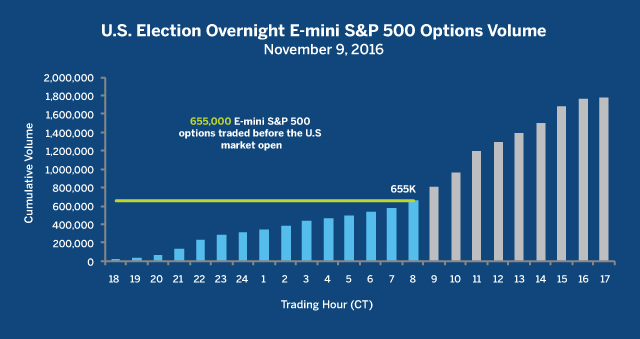 In the November 2016 U.S. election, equity index options volume rapidly rose overnight, with 655K E-mini S&P 500 options traded before the U.S. market opened the next day. Similarly, 475K+ contracts were traded overnight around the Brexit vote in June 2016. Take advantage of the around-the-clock liquidity of our futures and options products to help you stay ahead of this election. Use Monday and Wednesday options: E-mini and standard S&P 500 options expiring on November 5 (E1AX8 and S1AX8) and November 7 (E1CX8 and S1CX8). Use S&P Select Sector futures, across 11 sectors, to further express your view and complement your trading strategy. Industry experts Dave Hightower, Founding Principal of The Hightower Report, and Dan Basse, President of AgResource Company, preview the October Crop report and discuss why this report will be more focused on supply vs. demand. Industry experts Dave Hightower, Founding Principal of The Hightower Report, and Dan Basse, President of AgResource Company, preview the September 12 USDA report discussing corn and soybean yields in advance of its publication. Fallout from the escalating Sino-U.S. trade war is rippling through financial and commodity markets and if prolonged could impede growth in both nations. It was the year of the index for equity derivatives. Index futures volumes up 13% and index options volumes up 20% compared with FY 16/17. Average daily volume for the year was 55,000 (index futures) and 50,000 (index options) equating to $8.5 and $3.1 billion notional value traded per day. Interestingly non-roll months drove the increased futures turnover up 20% for the year thanks to increased volatility in February and April. Whilst index option weekly expiries continue to grow now accounting for 1 in every 5 trades in index options. June 2018 saw the Australian market close at its highest level in 10 years (6194) up 3.4% for the month. The ASX200 outperformed global markets due to strength in the resource and energy sectors and a turnaround in the performance of the banks after pressure on prices related to the Royal Commission. World market growth was characterised by continued strength in developed markets; particularly in the US, after a strong US reporting season. Europe was soft while Asia (excluding Japan) and emerging markets (EM) were off by 2-3%. Record volumes in SPI futures with just under 2 million contracts trading up 8% vs 2017. VIX is slightly up from last month currently at 13.5 and hovering between 12.5 and 13.5 for the month. Is the USDA forecasting politics instead of pure model/survey for their July WASDE report? Industry exports Dave Hightower, Founding Principal of the Hightower Report, and Dan Basse, President of AgResource Company discuss this and more. BOM's El Nino watch upgraded from "Inactive" to "Watch"